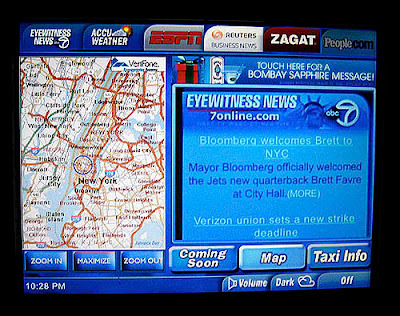 SF Taxi Media: Yellow Cab Announces Its Back Seat Taxi TVs. By John Han. Yellow Cab Announces Its Back Seat Taxi TVs. By John Han. “The SFMTA, Taxi Division, recently mandated companies to comply with new regulations regarding credit card processing, waybills, and computer records. We will be installing back seat payment terminals in all cabs and training everyone on their use. This is an expensive mandate for all companies. In return, the SFMTA is allowing all companies to shift the burden of credit card processing to an independent 3rd party processor when they comply with the new mandates. Yellow Cab Co-op is ready to comply with all the mandates requested and is scheduling to implement the new program by April 15, 2011. As of April 15th, 5% will be deducted from all credit card transactions. There will be NO CHARGE for Paratransit debit cards, Yellow Travel Cards, or vouchers. Credit card transactions have more than tripled over the past 5 years. Credit card business has reached almost 30% of our total business and is growing rapidly and has become a heavy burden for Yellow Cab to bear. Hopefully, we will be in a better position to invest in better equipment and services for our 1,500 drivers. Well, this comes as no surprise to me. I’ve been actively participating and watching taxi policies develop over the past couple of years. So I knew that taxi Tvs were on their way because Hansu Kim and Christiane Hayashi kept saying so, and that drivers who are currently getting charged nothing for credit card fees would soon be getting charged 5%. So that’s nothing new. The same will go for every company. It’s industry wide. But the way Yellow’s flyer is worded, it seems to be calling the backseat credit card Tvs a ‘mandate’ put forth by the SFMTA. Is it a mandate? Yellow’s flyer, in the way that it’s worded, seems to imply that the City has mandated these Tvs, that the cost to install the Tvs is expensive, therefore Yellow, and other companies are being allowed by the SFMTA to pass credit card fees onto their drivers. As a result, the companies may use the money saved from the SFMTA’s waiver to pay for the installation costs of the new equipment. Really? If that were the case, Yellow’s flyer would actually resemble something that has fairness. In actuality, Yellow, and all cab companies, as I understand, have been offered a ‘waiver’ by the SFMTA that would allow them to rid themselves of rising credit card costs, and pass those costs onto taxi drivers of up to 5%. Let’s first look at how currently, SFMTA regulations require all cab companies to cash credit card payments for drivers without charging them back a processing fee. This is an excerpt from SFMTA taxi regulations as it is currently posted for public viewing on its website. But in August of 2010, the SFMTA put out a draft memorandum informing that companies would be offered a waiver of that regulation. It read…. According to this memorandum, albeit a draft memorandum, the installation costs of the Taxi Tvs, were to be paid for by new advertising revenue generated by the Taxi Tvs themselves. Secondly, SFMTA is not necessarily mandating Taxi Tvs and thus allowing companies to pass credit card fees on to drivers to pay for installation, as Yellow’s flyer implies. It’s more the reverse. Taxi companies want to get rid of their credit card costs, and SFMTA is letting them do it in exchange for electronic waybills, and even Taxi Tvs. 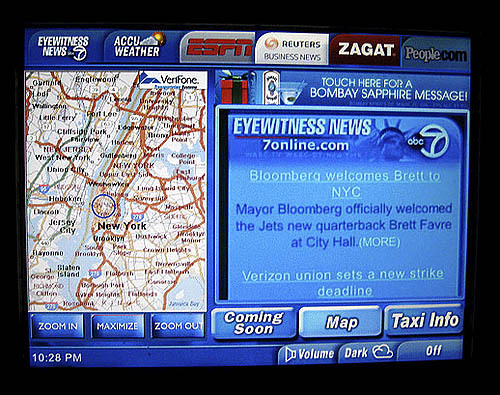 If it turns out that Taxi Tvs can actually pay for themselves through Taxi Tv ads, then according to this memorandum, taxi companies would be allowed through the SFMTA waiver to pass credit card costs onto drivers, and at the same time use new advertising revenue from the Taxi Tvs themselves to pay the installation costs of the Taxi Tvs. This means that money saved by passing credit card fees onto drivers is new money for companies, and may be allocated elsewhere. Could Yellow, by passing credit card fees onto drivers, and at the same time receiving ad revenue from Taxi Tvs, be saving significantly more than a million dollars a year for itself? And how would Yellow and other companies spend their new money? Would they offer medallion holders more money? Would they pocket it for their own savings and retirement? The SFMTA, in exchange for electronic waybills and backseat Tvs, has dealt to the cab companies, new money to play with, while passing along added charges to drivers. shared 50-50 with the driver of the vehicle. (c) Advertising revenues shall be reported to SFMTA quarterly. The proposed 50/50 split in advertising revenue highlighted in the memorandum above, I believe, was the SFMTA’s attempt to recognize that it had just dealt away a degree of drivers’ protections under the SF Transportation Code, and it was trying to reconcile. Drivers, who had previously been protected under SF Transportation Code Section 1106(p)(6) prohibiting credit card charge backs, would now be charged up to 5% for credit card fees. However, at the last Taxi Advisory Council meeting held Monday, March 14, 2011, Deputy Director of Taxi Services Division Christiane Hayashi confirmed that the 50/50 split had been changed, and that the final split would be 90% going to the cab company, and 10% going to… not the individual driver as originally proposed… but to the overall Drivers’ Fund, and that these changes are final. The Yellow Cab Coop flyer contains several misstatements regarding the regulatory requirements for credit card processing fees and rear seat units as well as the cost of this program to companies. Things are going to different directions and its becoming the opportunity for the companies to generate more profit while drivers have to pay more and make less. Seems like something need to be done and the companies are translating some exceptional the way they want and become misconceptions. There is no cost to the companies and the equipments are being paid by the provider. Is there anyone who will protect drivers? What kind of action will make the voice be heard? I think we should look at ways to take some of these ideas where profit will be gained to divert it into the drivers fund that can be used for important issues such as uninsured motorist, full coverage insurance or other safety nets to protect the drivers. 1. It's not a tv - it's a video monitor. According to CH no audio will be allowed. 2. 10% (not 50%)will go to a drivers fun. The vendors not the companies will get the other 90% of the advertising. 3. The MTA is not currently requiring drivers to do as Yellow says. Drivers can get their own merchant accounts that charge 2.75% per transaction - at least I think that the latest. I suppose I'll pass on Hansu Kim's assurance that people tip up to 30% higher on these terminals than they normally do. I don't know if this is true but it's one reason Hayashi okayed them. Chase offered me credit card transaction free of charge, so can I use Chase credit card machine instead yellow credit card machine? I don't know why not. But you maybe should check first with SFMTA Taxi Services. I don't see why they'd say you couldn't. First, drivers DID NOT AGREE to this deaL, and no one asked them,for good reason. Where’s the great earnings in this deal for the average driver? Using BANK CARDS, for the most part, the not paying for it is obvious,IS NOT not in a driver's best financial/safety interest. It causes passengers not to pay attention, when you should need them. Bank cards essentially reward banks for doing essentially nothing. Whatever convenience they offer respect to taxis, is almost absolutely ZERO. Their use should not be promoted. So then what is the average price of a taxi ride in San Francisco anyway? Isn’t it a lot faster, and LESS DANGEROUS, to take the cash? Of course. Taxis make money by moving. You don’t move, or earn, waiting for a bank card of $10.00 to clear. Usually small businesses will not take credit cards below a certain amount. Because it ain’t worth it. Why must a driver? Absent a huge volume of sales, taking bank cards DOES NOT COMPUTE. DOES NOT COMPUTE. DOES NOT COMPUTE. THIS IS NOT NEW YORK. NOT NEW YORK, NOT NEW YORK. NOT EVEN NEAR NEW YORK. Five percent sounds like chump change to you? Think not then of the exceptional driver, who’s driven perhaps preferred hours most of his or her life. NO, think instead of the average. Think of the gas and gate driver, no-medallion, nor-about-to-acquire-one-NOW-driver.Think about the children who rely on a drivers’ earnings. Think about the mortgage. Again,paying 5% on $7.00, $8.00, $15.00, and the occasional airport $40.00, is absolutely silly. For taxi driving business, bank cards are worthless. Who thought of this hustle anyway? Oh, what contempt must we have for intellect. Now if drivers had those airports trips from the hotels (which the City has taken away from them, by what appears to be benign NEGLECT at best), paying 5% wouldn’t hurt so bad. As it stands,the proposition is ABSOLUTELY HILARIOUS. How is it that certain persons would force such a contract on drivers, in exchange for NOTHING in turn is simple incompetence,or worse. Or is that I’m just a little crazy, missing the elephant in the room crazy, maybe, and all of those people making BIG money up there are super sane?